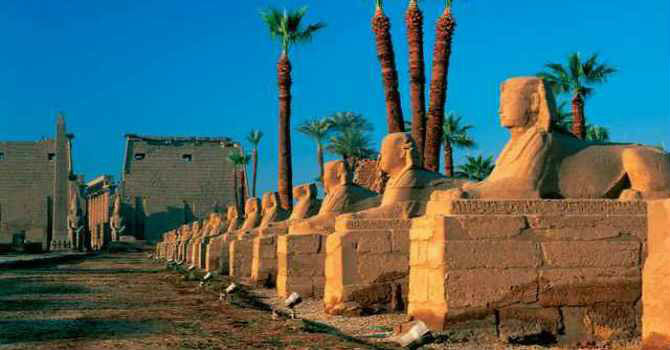 Take the 50 minuets flight from Cairo to visit Luxor open air museum, we will pick up early in the morning from your hotel and drive Cairo International Airport then fly to Luxor. Meet in Luxor Airport then join the expert Egyptologist guide to the impressive temples of Karnak, it was built in series of ages starting from Middle ancient Egyptian Kingdom to the Greco Roman ages by several generation. Then cross the Nile River by Felucca typical Egyptian sailing boat to uncover the tombs and temples of the New Kingdom in the ancient city of Thebes. Stop at the famous Memnon Colossi, 2 quartz status are the only remnants king Amenophis III temple. Proceed to the famed Valley of the Kings where 62 Pharaoh kings are buried in thier rock cut tombs rich with decorations and colors. The known tombs belong to Kings Tutmosis I, Tutmosis III, Tutankamon, Ramssess VI, Mrenptah and AmonhotepII. Explore Queen Hatshebsut Temple in El Deir Al Bahary, built and devoted to this exceptional Queen who ruled Egypt during the eighteenth Dynasty, the temple is surrounded with series of rugged mountains and limestone cliffs. Lunch will be served in Luxor then return to airport, fly back to Cairo then transfer to hotel.